Say it three times fast. Look at this lovely. I got it on a recent trip to Palm Springs, where we stayed at the Hotel California. We could check in any time we liked (after 3pm) and we could never leave (but had to come home anyway). Our first night in town, we strolled though a little outdoor mall with a collection of vintage stores on the north end of the Palm Canyon shopping district. I found the greatest little shop, called Bon Vivant. Loved it. The owner has a great collection of stuff...just so well curated, I wanted to pause and fondle it all. 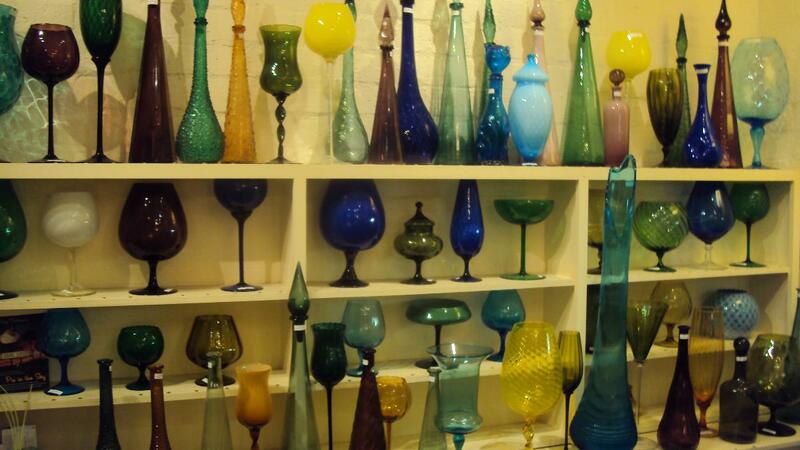 He also had a beautiful collection of vintage Blenko glass pieces. They're like big shards of hard candy that you wanna lick. Or at least I do. Usually my husband sort of intimidates me into not spending when he's around. (I won't say he's cheap, but....) However, after about ten minutes inside Bon Vivant, I knew I wasn't going to be able to leave empty-handed. Also, we were in town for a romantic anniversary getaway, so I was able to play that card. Turns out that Bon Vivant and its collection of Blenko glass was mentioned in this April's issue of Martha Stewart Living. Read all about that on the shop website, or visit their Facebook page, where I read how J.A., Jonathan Adler himself, is quoted as saying that this store has some of the best pieces at some of the best prices around. Well there ya go. And that's why me and J.A. are so tight like that, see? Read about the rest of my desert weekend here, over at my new-ish travel blog. I'm still sorting it out over there, and trying to figure out how to write an informative post in less than 12 hours. Sheesh.